Andrew Langtree studied at Sir Paul McCartney’s Liverpool Institute for Performing Arts. Shortly after graduating, he became part of the original London cast of Mamma Mia in 1999, originating the role of ‘Sky’. He has appeared in numerous productions at Birmingham, Clwyd, Oldham, Glasgow and The Manchester Royal Exchange. Andrew is also a well-known TV actor and has starred in popular programmes such as Hearbeat, Holby City, Cutting It, Coronation Street and Emmerdale. 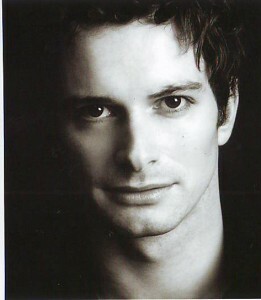 At the time of the interview, Andrew was performing as Carl Bruner in the new London West End musical Ghost at the Piccadilly Theatre, a role he also originated. Despite his very busy schedule, Andrew kindly answered a few question about himself and his career. Enjoy this fabulous new interview! When did you first realize that you wanted to be a singer/actor? I think probably when I was around 12 years of age, I started to do improvisation in drama classes at school. I was quite shy, but had no problem with getting up and making people laugh. I was hooked. The singing came later as I did musicals for am-dram companies, though I still don’t really consider myself to be a singer, per se. Did anyone in particular inspire you or have you got any role-models? I don’t know that inspiration is the word, but my drama teacher at school, Ann Brian pretty much coerced all the lads into doing drama. She promised if we didn’t do the school shows, that she’d arrange it so that we couldn’t play rugby for the school. We believed her and all the boys were involved somehow. Ann and I remain good friends today. In terms of actors, I’d have to say my biggest inspiration is Dustin Hoffman. To play Benjamin in The Graduate, then Rizzo in Midnight Cowboy within the same year is a hell of a transformation. Throw in his performance in Marathon Man and you get the picture of the kind of actor I aspire to be. Is it true that former Prime Ministers wife Cherie Blair asked you to sing in front of Her Majesty the Queen at Buckingham Palace? What was it like? Well, she didn’t exactly call my mobile to see if I was free, but yes, she’s from Liverpool originally and I suppose she thought it would be a good idea to have some students from LIPA to represent. We did a few numbers from a musical called Closer Than Ever, which we were performing at the National Student Drama Festival at the time (we came down from Scarborough early morning on a mini-bus. Back that night.). I recall being barged out of the way by a photographer at the palace, eager to get a picture of our friend, Julie, laughing with the Queen. Julie had shocking pink hair at the time. The next morning, back in Scarborough, I went to the shop for a pint of milk and there was the picture on every front page on the newspaper stand, with the headline ‘Cool-Britannia’. It was surreal. Actually, I’ve performed for the Queen three times, once when she wasn’t even present, but that’s another story. You studied at Sir Paul McCartney’s Liverpool Institute for Performing Arts. Please share a memory or two. There are too many brilliant memories from my time at LIPA to choose from. I was one of the lucky first intake of students and recall just being over-awed by this fantastic building that two hundred or so students had the run of. I suppose my fondest memories are of working collaboratively with all the students from the other disciplines, music, dance, management, design and so on. There was a real collaborative nature about the whole place, which, in itself, promotes a healthy way of looking at the world of work I think. I do recall looking around at my classmates, just before we let in the audience to a promenade production of ‘The Caucasion Chalk Circle’ by Bertolt Brecht. There was a cool look of absolute confidence about the whole company. We knew we had something that was going to blow the audience away and all of us cared about the show so much. It’s a rare company feeling in the professional world. I’m pleased to say I experienced this most recently with Ghost. I am very lucky. Shortly after your graduation, you originated the role of Sky in the London production of Mamma Mia. Please tell us about this experience. When I trained at LIPA, there was no musical theatre course as such, but people in the outside world seemed to think that that’s all I’d studied. I actually got my highest marks at drama school for Shakespeare and I still bore my friends with the fact I’d love to play Iago to this day. Therefore I was as shocked as anyone to find myself three months out of drama school in a West End production of Fame the Musical and just about to embark on some crack-pot idea about weaving Abba songs into a full scale musical. I wasn’t sure it was a good idea at all and was certain my career was over before it had begun. Come first preview and the audience reaction was just incredible. A lovely actress by the name of Eliza Lumley was stood holding my hand during the bows and as I stared at the screaming, standing ovation in shock, she said to me ‘Well darling, it looks like we’ve got a hit on our hands’. The House Full signs went up that night and never came down for the rest of the year’s contract. The rest, as they say, is history. You have appeared in numerous productions at the Manchester Royal Exchange Theatre. Please tell us about your time there. When I decided to move from musical theatre into what might be referred to as legit theatre, the rep companies seemed like the places to go. I could audition for roles I might never be seen for elsewhere. I played parts at Birmingham, Clwyd, Oldham, Glasgow. I got around a bit. But the best theatre I ever played was The Manchester Royal Exchange and I’m really grateful to them for letting me have so much fun. I’m especially grateful to Jacob Murray. The main house and the studio are both great spaces, but I really think there’s a magic to the energy in the main house. This seven sided glass module that sits in a great, marble hall. Making your first entrance into what feels like an arena, with the audience completely surrounding you could be a daunting experience. Thankfully I made my first entrance there naked, on an electronically automated bed, whilst pretending to fellate someone, so the audience were of little concern to me. They invited me back and within a few years, I played a bullied young man from the wrong side of the tracks in Sydney, a 21-year-old Jewish New Yorker in a Neil Simon play, a nineteenth century conman, hoodwinking the London aristocracy and numerous Americans with varying degrees of mental stability. It was a lot of fun and I learned a hell of a lot. You are currently originating the role of Carl Bruner in Ghost the Musical. Can you describe your character to someone who has not seen the film? If you haven’t seen the film, then I really don’t want to say too much. Tony Goldwyn is one of the reasons I wanted to take this job. He did such a great job in the movie. My job in playing Carl for the stage is to explore what’s going on between the lines. Carl has a history which no one else in the piece would ever imagine could be possible. I wanted to explore with Carl, just how easily a sane, normal person like you or I could take a slide out of control with just a few poor choices and the right/wrong environment. What’s it like to be playing the ‘baddy’? I think playing the ‘baddy’ is fun and difficult in equal measure. Although, because I have found feasible reasons why Carl would do the things he does, I don’t really think of him as a baddy at all. Just as someone who has a slightly wonky moral compass. In fact I’m often quite shocked by the audiences reaction. They sometimes seem to genuinely hate me by the end…… That’s one of the fun parts. The lighting, special effects and choreography are amazing. How would describe the spectacle that is ‘Ghost’ from an actor’s point of view? During rehearsals, we had a fairly basic mock-up of our incredibly complex set. So when it came to the start of our four week technical rehearsal, the cast were as excited as it’s possible to be in a tech. I tried to describe the show to some of my friends during that time and eventually gave up. It’s indescribable. We’ve had an incredible team working on this show and when it all comes together at 7.30 every night it’s really something special. I feel proud to be part of it. What’s your favorite Ghost song? I think it has to be ‘Nothing Stops Another Day’. Not just because Caissie Levy could stop your heart by singing the phone book, but I particularly enjoy her singing the lyric; Because the tallest mountain cannot stop the tallest stream, Winter can’t hold back the Spring, no matter how dark it may seem. Come what may, nothing stops another day. It seems to sum up something of the optimism that runs, quietly, through the whole show. A lot of people have seen – and love – Ghost the film.Why should they go and see Ghost the Musical? Although the show sticks fairly closely to the script and plot of the movie, it’s a different telling of the story altogether. The fact that the story requires some pretty incredible special effects to be staged live, takes it to a whole new level. We certainly don’t try and copy the movie. What would be the point? We tell the story for an audience of today and with old and new technology, enhance it. As I mentioned, I’m a big fan of Shakespeare. There’s something very satisfying about expressing yourself through his text that no other writer seems to get close to, although, Schiller, Chekhov, Brecht and Williams are satisfying in different ways. Team that with the fun I’ve had being so insidious with Carl and I’d still have to go for Iago in Othello. Yep, that’d be fun. I always try and chase the perfect show. That’s a performance where you leave the stage and realise that you hit every mark and did everything to the best of your ability. It doesn’t often happen, so I was thrilled one night at the Royal Exchange when I came off stage with the knowledge that I had absolutely nailed my performance on….. Then I looked down and realised that my flies were gaping wide open and nobody probably cared about a word I’d said. I check my flies all the time now. I’m ashamed to say that I’m still yet to see War Horse. I lived away for a couple of years when it opened and just never got round to it, despite what great things I’ve heard. Warhorse, definitely. You are also a well-known TV actor. You played Leon on Coronation Street (2009) and Justin Gallagher on Emmerdale (2010). What’s it like to star in a soap opera? Soap is fast! You know, things can change on the spot with TV, but particularly with a soap. The producers have to be sensitive to current affairs and the concerns of a massive viewing public, so you have to be on the ball as an actor to cope with that. There’s such a massive difference from stagework when you go into a soap. You even use a different part of your memory to store your lines and they’re gone almost as soon as the director calls ‘cut’. What do you like about working in front of a camera? At first I didn’t like it at all to be honest. Watching the rushes back would be painful, as you never have the chance to be quite so critical of yourself in any other job. At first, so much of it is about learning the parameters of the medium. You’re constantly saying to yourself, ‘Ok don’t do that next time. You’re blinking too much.’ etc. Once you get the hang of it though, it’s fantastic. you can get a certain level of reality sometimes, safe in the knowledge that if you do dry or muck up, you can have another go instantly. How does performing to a live audience compare? Nothing ever beats the thrill of a live performance. Sometimes you can just accidentally alter an inflection here and there and hear a thousand people all respond in the strangest ways. Laughter and tears are the least exciting audience reactions to me. I played the gentleman caller in The Glass Menagerie a few years back and one night in Malvern, I said ‘You think you’re the only one who’s disappointed? Just look about you, everyone is disappointed.’ And I swear, every woman in the audience and a few of the guys too, without a missing a beat and in perfect unison, went; ‘Uh-huh!’…… I hope it wasn’t a reflection on the show. Is there anyone you’d would you really like to work with (TV/film or stage)? What are your long-term ambitions. I have always wanted to be as versatile as possible, exploring different mediums where at all possible and exploring as many varied character roles as possible. I think after Ghost, I’d possibly like to persue something more on screen, although I tend to change my mind as often as my shirt. Who knows? What do like to do when you’re not working? I don’t like not to be working. Although I’m acutely aware that I haven’t travelled nearly enough and I think that would do me a lot of good. Otherwise I like to walk and I like to run. It’s good for the grey matter. Many thanks for this fantastic interview, Andrew! I wish you all the best for Ghost’s continued success and for any future projects!